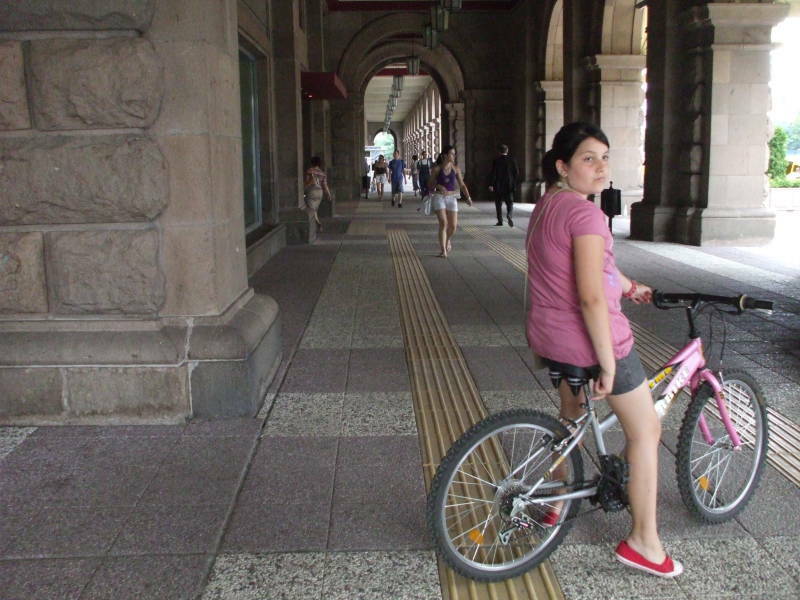 We are visiting Sofia, Bulgaria. This is part of the Athens to Paris by Train series, start at the beginning to get the background and the details so far. We arrived here by overnight train from Thessaloniki. Sofia has been settled for a long time. Remains of prehistoric settlements have been found near the center of the modern city. However, it only became a major city after 1879, when Bulgaria was liberated from Ottoman rule and Sofia was declared its capital. Meanwhile the city had been briefly ruled by Philip of Macedon and his son Alexander the Great in the 4th century BC. It was mentioned in historical writing under the name Serdica or Sardica by 59 BC, thirty years before being conquered by the Romans. Really, that was Σερδικί or Σαρδικί. It became significant in early church history, one of the first Roman cities where Christianity was legally recognized as an official religion and hosting the Council of Sardica in 343 AD. In early medieval times it became Triaditsa, Τριάδιτζα in Greek. It became part of the First Bulgarian Empire in 809, and grew into a trade and administrative center known by the Bulgarian name Срѣдєцъ, or Sredets. Sredets fell to the Byzantine Empire in 1018, but then was incorporated into the restored Bulgarian Empire under Tsar Asen I in 1191. The current name София or Sofia first appeared in the 14th century. It refers to the famous Haghia Sophia church. Just as is the case with the church by the same name in İstanbul, it is named after the Christian concept of Holy Wisdom but many assume there was some "Saint Sophia". The Ottoman Turks captured the city in 1443, making it the capital of the Ottoman beylerbeylik of Rumelia. The Ottomans called the city Sofya, although Sredets continued to be used until the late 1700s. Contrary to most foreign visitors' assumptions, its modern name is pronounced SO-fee-a with the emphasis on the first syllable, and not as so-FEE-a. Sofia is in a valley surrounded by mountains. Three mountain passes leading to the settlement carried roads that were important since antiquity, connecting the Adriatic Sea coast and central Europe to the west and northwest, the Aegean Sea to the south, and the Black Sea to the east. Sofia is at an elevation of 550 meters, while Mount Vitosha, a prominent landmark visible from the prominent avenue named after it, peaks at 2,285 meters. The city is unusually close to the borders with three other nations: Greece, Macedonia, and just 55 kilometers from the Serbian border. Крам Свати Николай, Kram Svati Nikolai or the Church of Saint Nicholas, is on ulitsa Tsar Osvobodite. 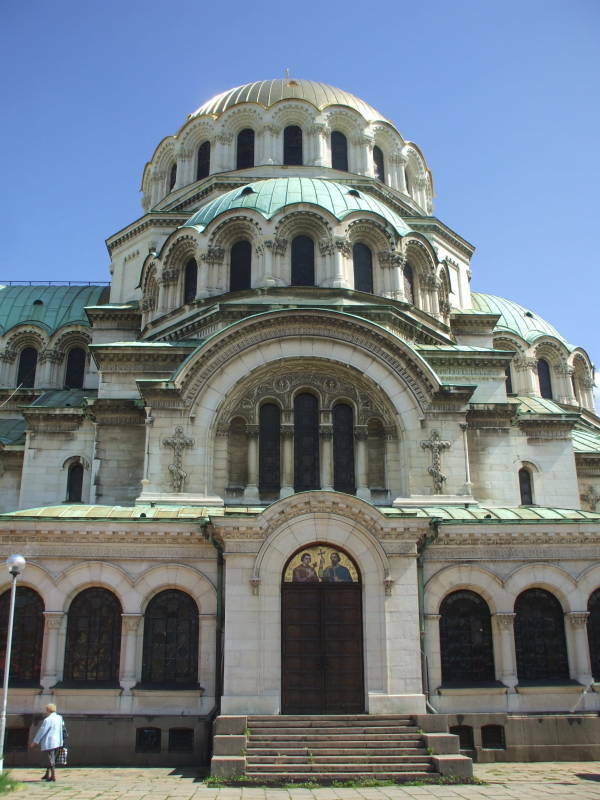 It is built to a classic Russian Orthodox design, although it was built only in 1912-1914 for the Russian population of Sofia remaining there after the Russian liberation of Sofia from the Ottomans. The church was built on the former site of the Saray Mosque. 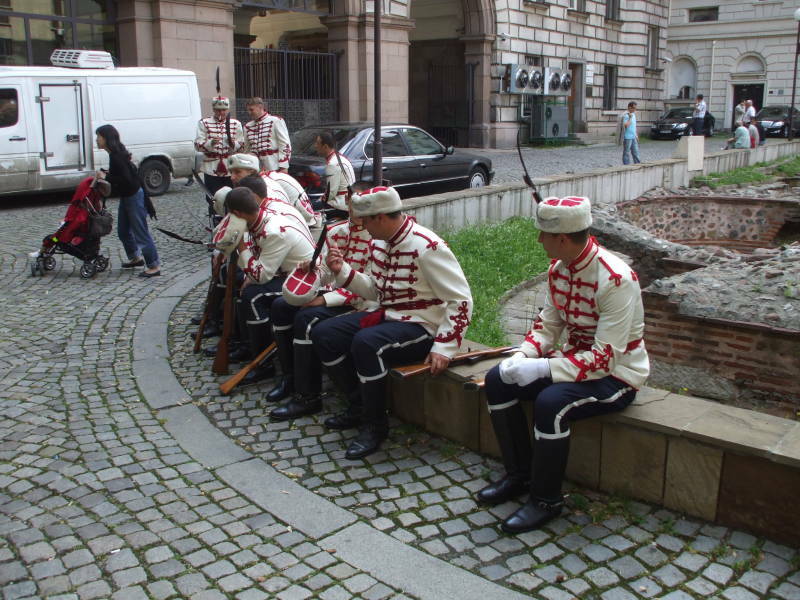 During the Russo-Turkish War of 1877-1878, Russian forces seized Sofia. 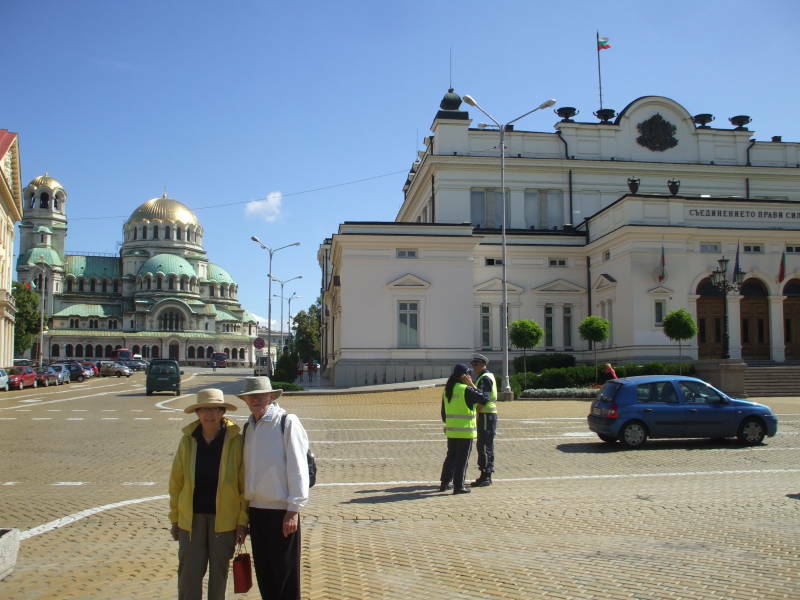 The city became the capital of the newly formed autonomous Principality of Bulgaria and was officially renamed as Sofia. 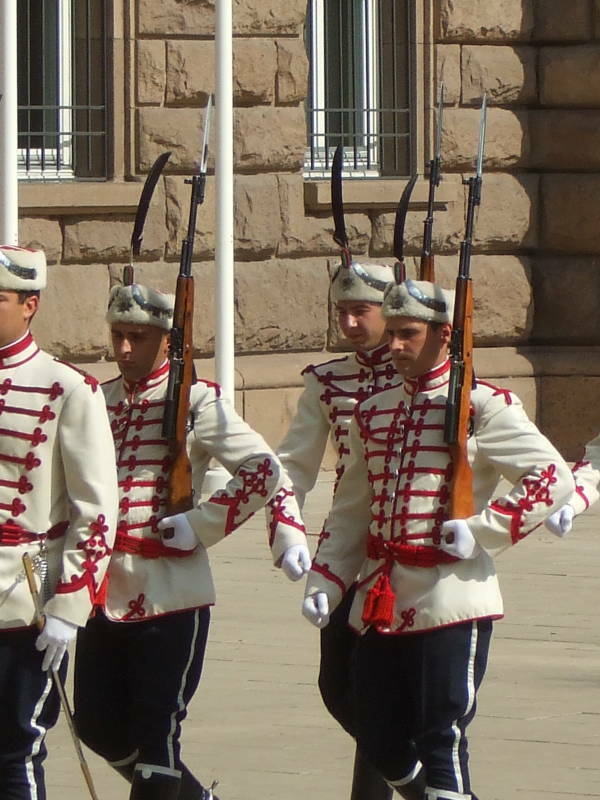 The principality was upgraded to the Kingdom of Bulgaria in 1908 as the Ottoman Empire was collapsing in on itself and the Great Powers were ramping up to World War I. 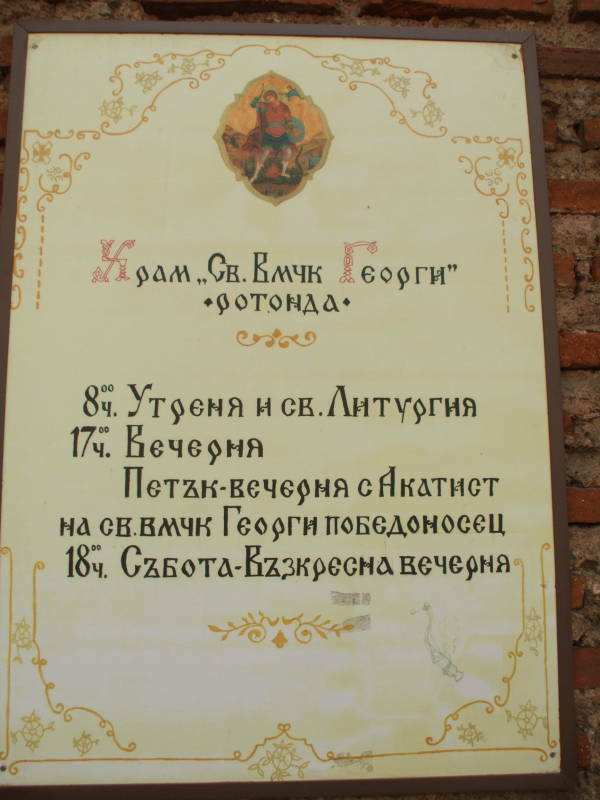 The declaration of Bulgaria as a fully independent kingdom and Ferdinand as its Tsar happened in Veliko Tarnovo, which we visited later in the trip. The dark interior and classic architecture makes it seem much older than it is. The traditional Christ Pantocrator appears in the central dome. The interior features murals and icons painted in the 11th through centuries. 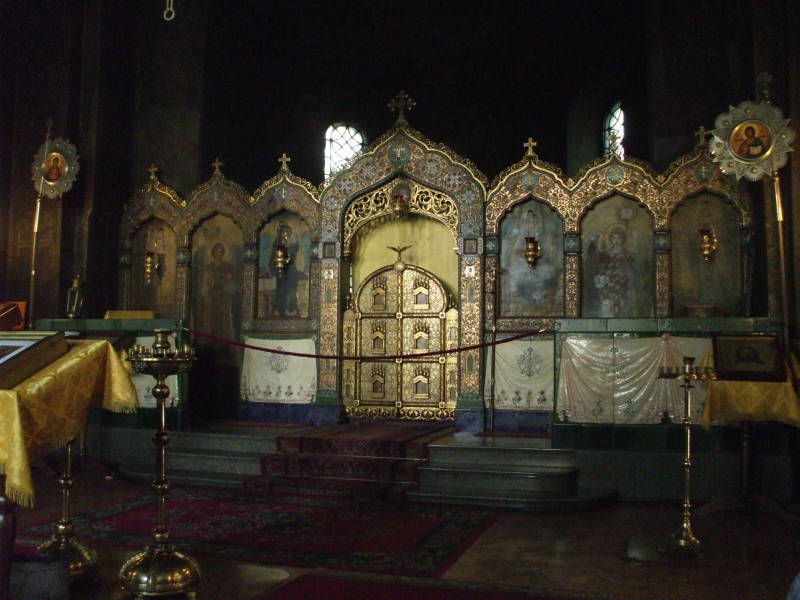 The iconostasis of an Orthodox church separates the apse with its altar from the main space of the nave. 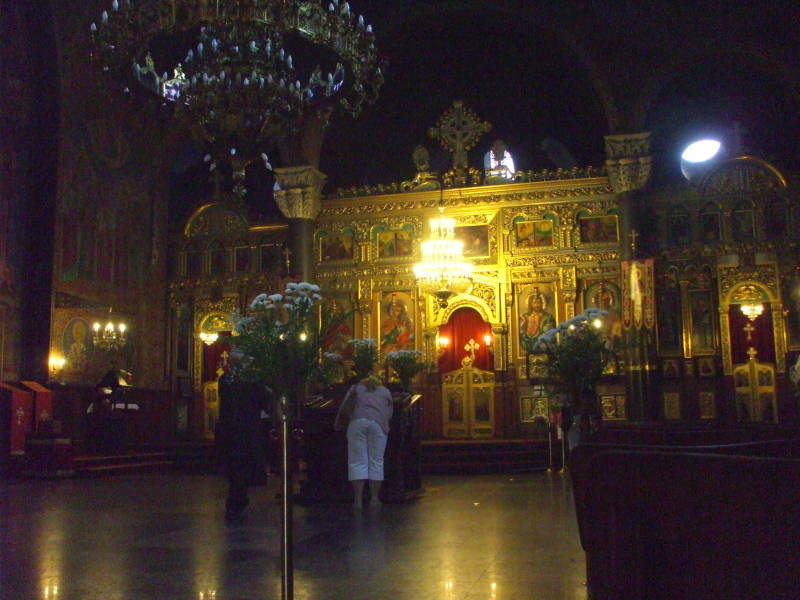 The church is dedicated to Saint Nikolai the Miracle Worker The saint was the patron saint of the Russian leader at the time, Tsar Nikolai II. The church is known locally as църква "Свати Николай Чудотворец", tsarkva "Svati Nikolay Chudotvorets". Or at least that's the formal name. Most locals simply call it "the Russian Church", Руска църква. 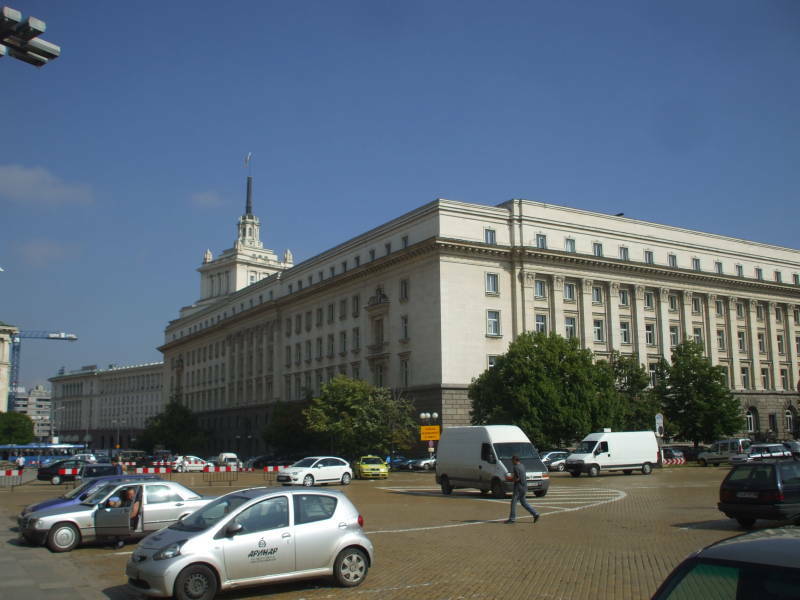 The somewhat Stalinist Ларго or Largo houses a number of administrative offices. It was built in the 1950s and is now regarded as one of the prime examples of Socialist Classicism. The Largo used to be the headquarters of the Bulgarian Communist Party. 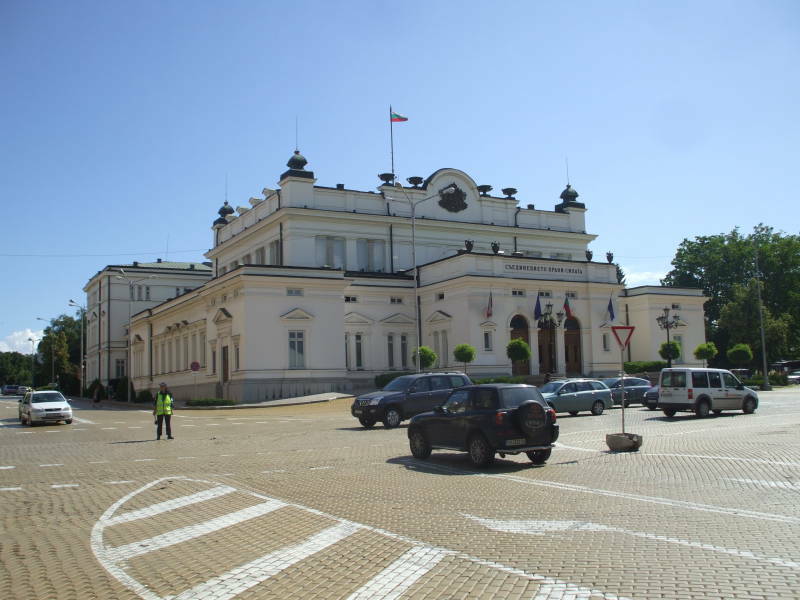 Now the center is used by the National Assembly of Bulgaria. 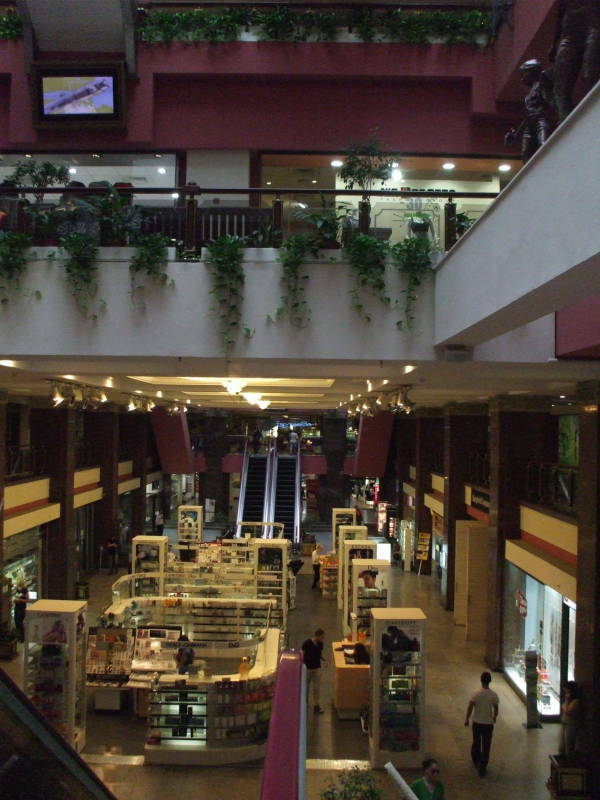 Other parts of the complex — the ironic parts — are currently used by a high-end department store and a Sheraton hotel. A Bulgarian flag is flown on the large spire, where a red star used to appear. 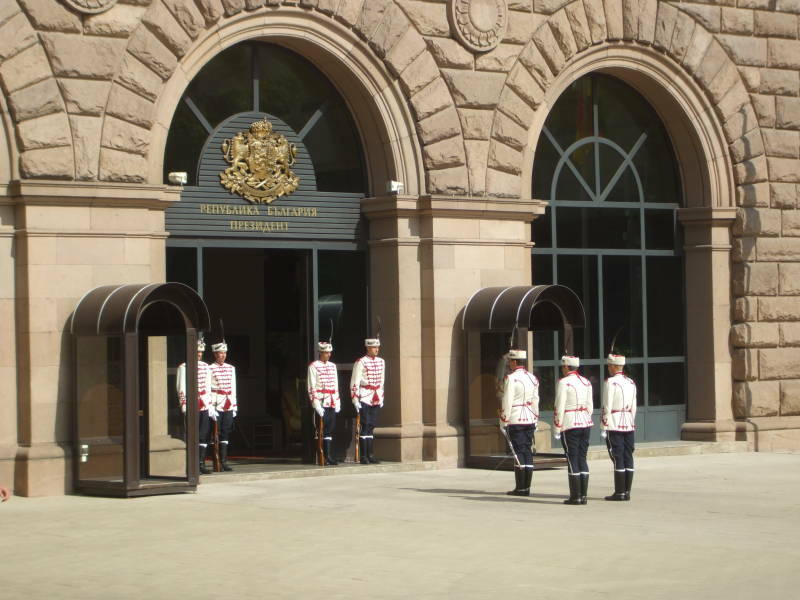 The Bulgarian President's office is in a large complex across from the avenue from the central building of the Largo. We got there just in time to see the changing of the guard. If you miss it, just wait another hour. The Presidency forms one side of a rectangular complex built around a rectangular courtyard. A larger portion of that complex is occupied by a luxury Sheraton hotel, with the price of a single room listed as starting at €310 and going up from there. The Presidential offices and the Sheraton Hotel surround a large courtyard where you find the Church of Saint George, commonly known as the Rotunda Church. 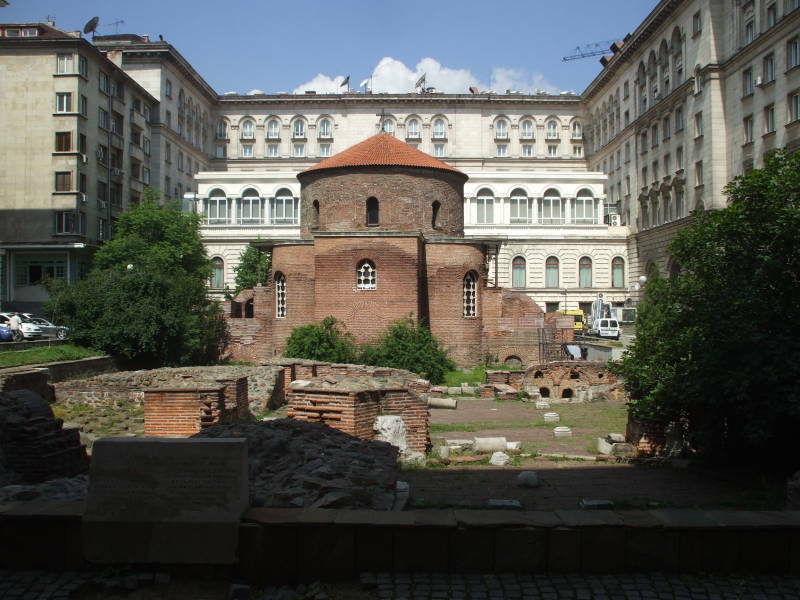 The Rotunda is the oldest building in Sofia, built by the Romans in the 300s. Its interior has frescoes from the 12th through 14th centuries, painted on top of two earlier layers of frescoes dating back to the 10th century. The schedule shows that it's active. 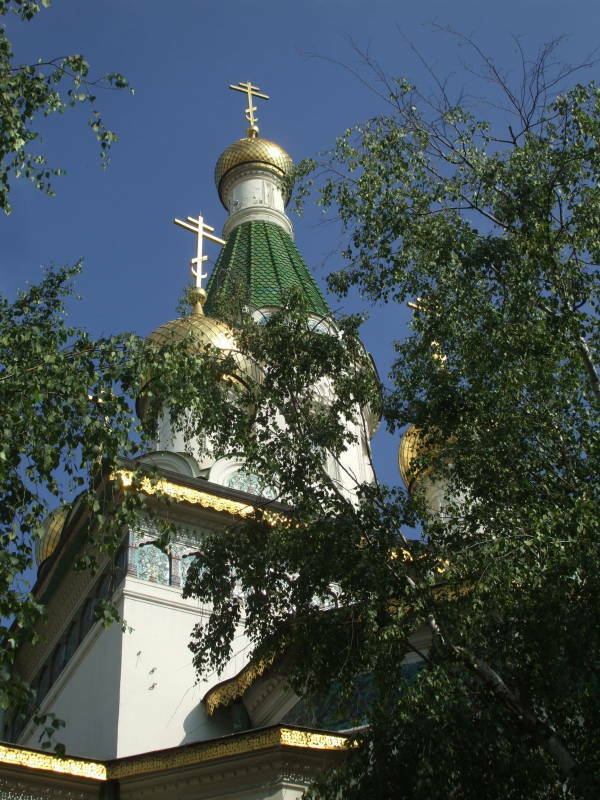 Утреня or utrenya (morning prayers) and Holy Liturgy daily at 0800. Вечерня (or Vespers for the Latin speakers) at 1700, 1800 on Saturdays and Sundays. The centrally located Църква Свети Неделя, tsarkva Sveti Nedelya or the Church of Holy Sunday, was probably built for the first time in the 10th century. It was demolished and rebuilt in 1856-1863, the reconstruction slowed by earthquake damage suffered early in the project. Elements of the Bulgarian Communist Party blew up its roof on 16 April 1925. This was an attempt to kill Bulgarian Tsar Boris III, and they staged it during the funeral service for a general who had been killed in a communist assault just two days before. 150 people were killed, including most of the Tsar's cabinet, but Tsar Boris was uninjured. 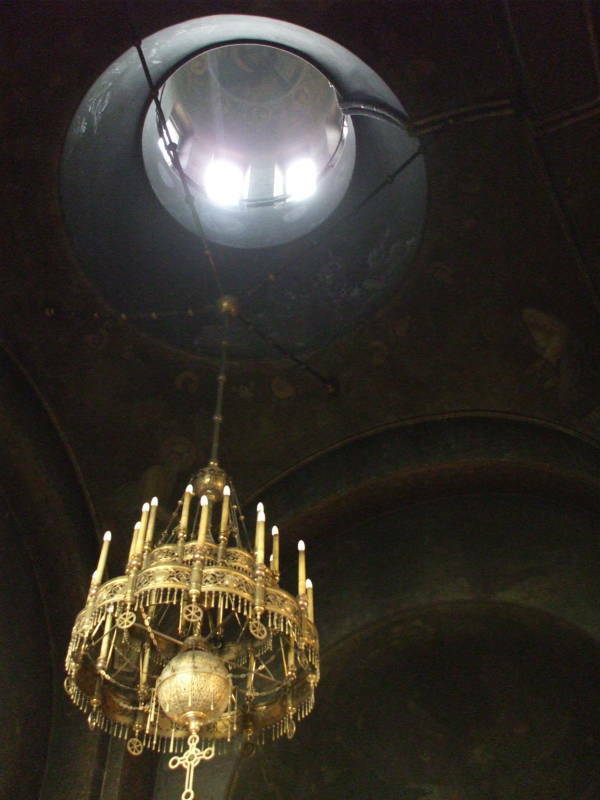 The communist agents had carried 25 kilograms of explosives into the church's attic over the preceding two weeks, and placed them in a package above one of the main dome's columns. They then killed the general, planning to use his funeral to gather their ultimate targets in the church. Their explosion dropped the main dome onto the crowd at the funeral. Tsar Boris was not injured because he was not there — he was in another city attending another funeral for the victims of a previous attempt on his life. The communists were certainly aggressive, but to the point that they interfered with their own plans. Despite the mid-1800s demolition and reconstruction, and the 1925 communist bombing and subsequent repairs, the interior is in great shape today. 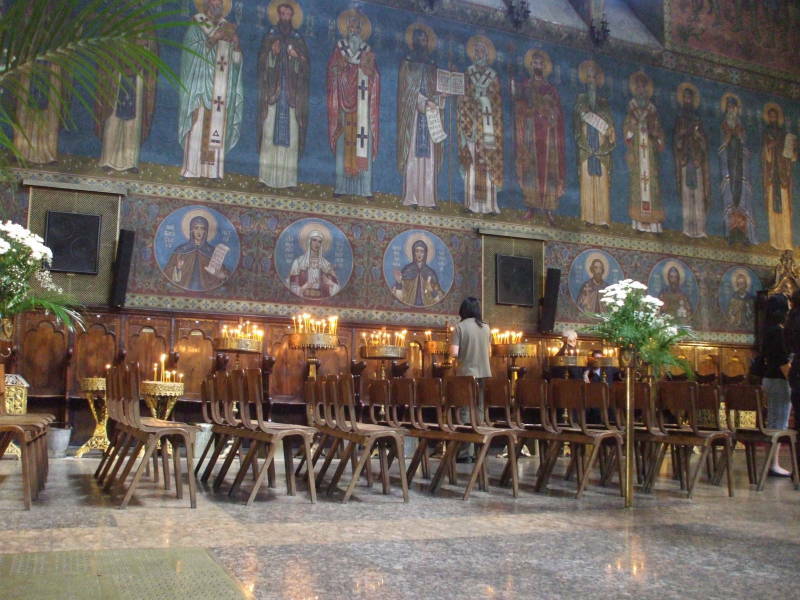 The murals aren't actually Byzantine, they were done between 1971 and 1973 in the classic style. But they are definitely in the Byzantine style and depict Byzantine-era saints. The gilded iconostasis survived the bombing and was reinstalled after the most recent 1927-1933 reconstruction. 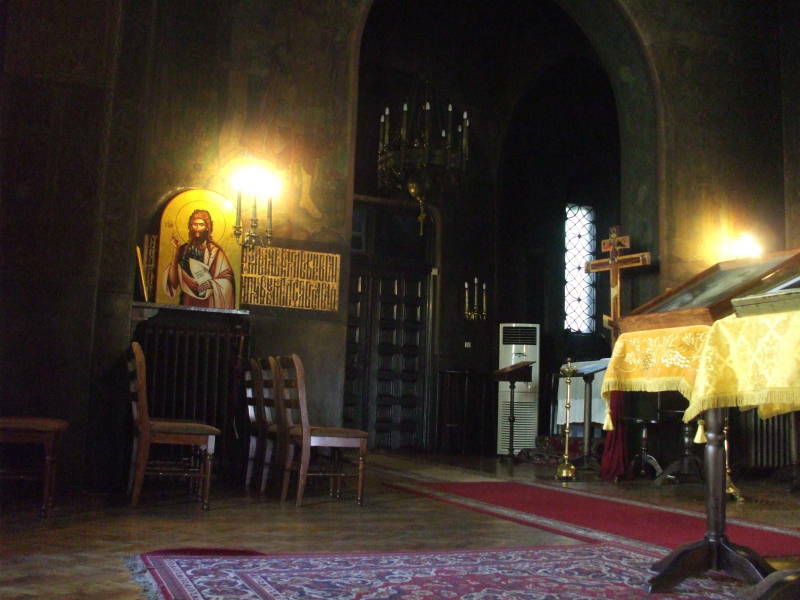 To the right side of the iconostasis, seen at left here, there's a glass case holding the velvet robed body of the medieval king of Serbia (and, more recently, Orthodox saint) svati Kral Stefan Milotin. 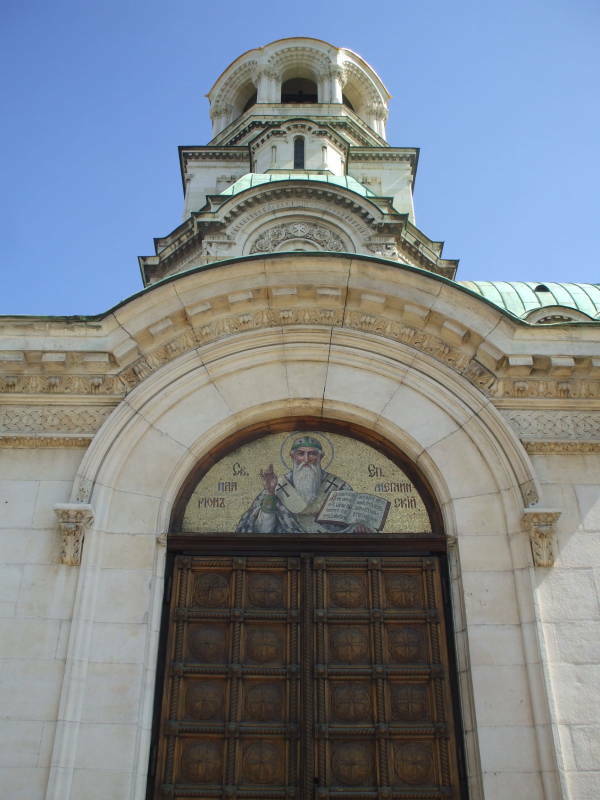 He ruled Serbia 1282-1321, and now his bones are believed to have miraculous healing powers. 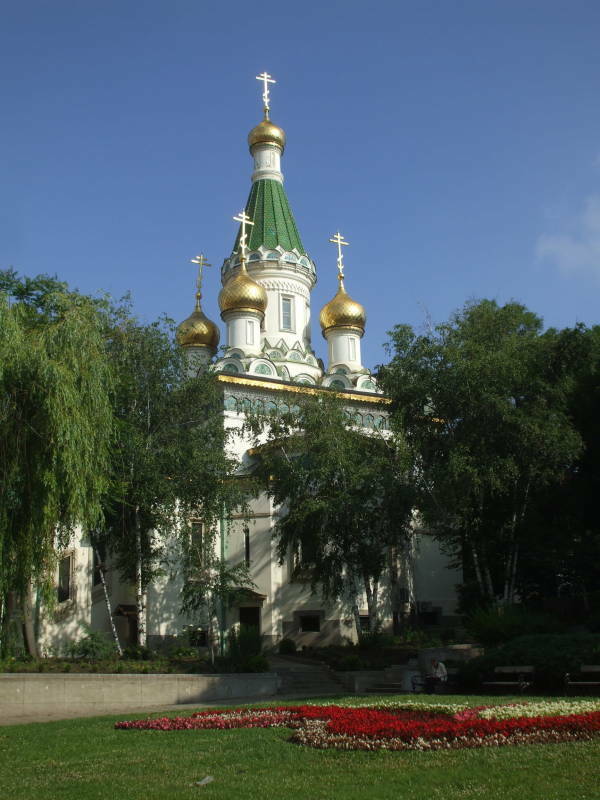 Because of the relics of King Stephan Milotin, the church is sometimes called Свети Крал, the Svety Kral or Holy King church. Булевард "Витоша", Vitosha Boulevard, is the main shopping avenue in the city. 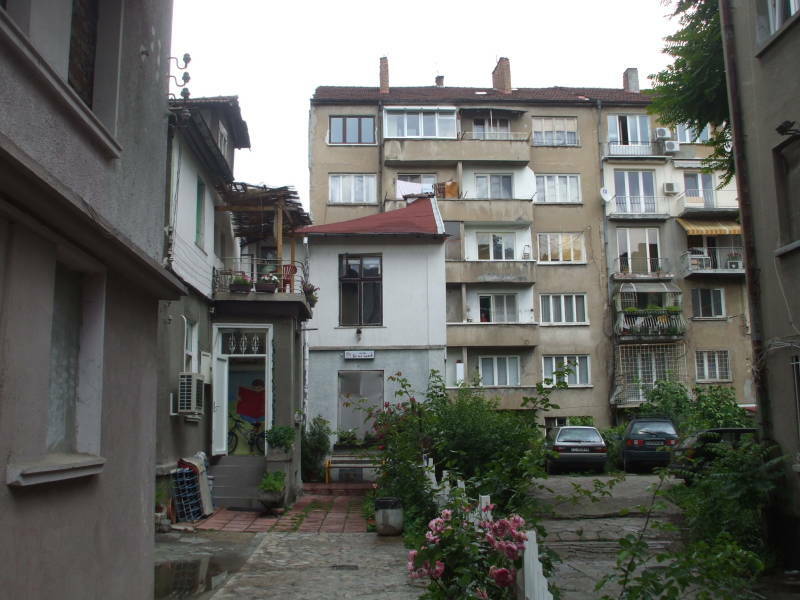 The people of Sofia often just call it Витошка or Vitoshka. Something I did not expect: Vitosha Boulevard has been ranked as the 22nd most expensive commercial street in the world. 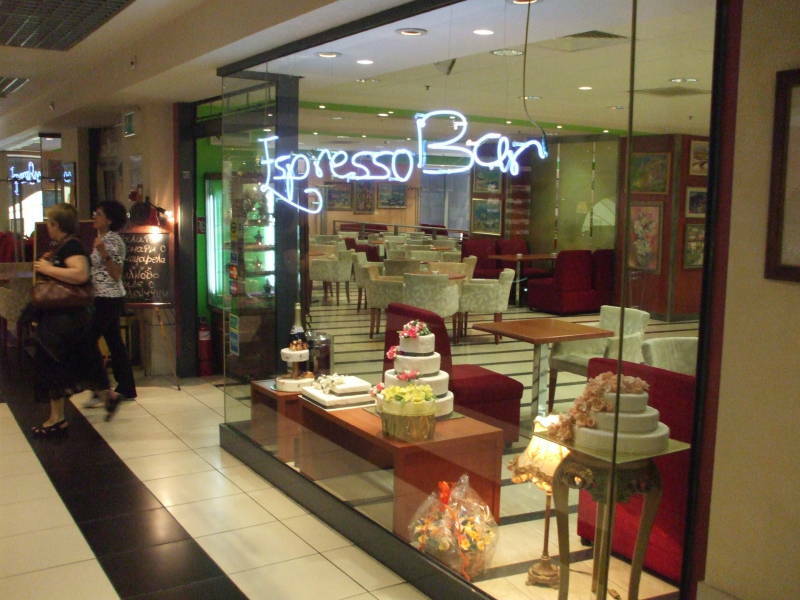 It has a lot of restaurants and bars between the many high-end fashion outlets. 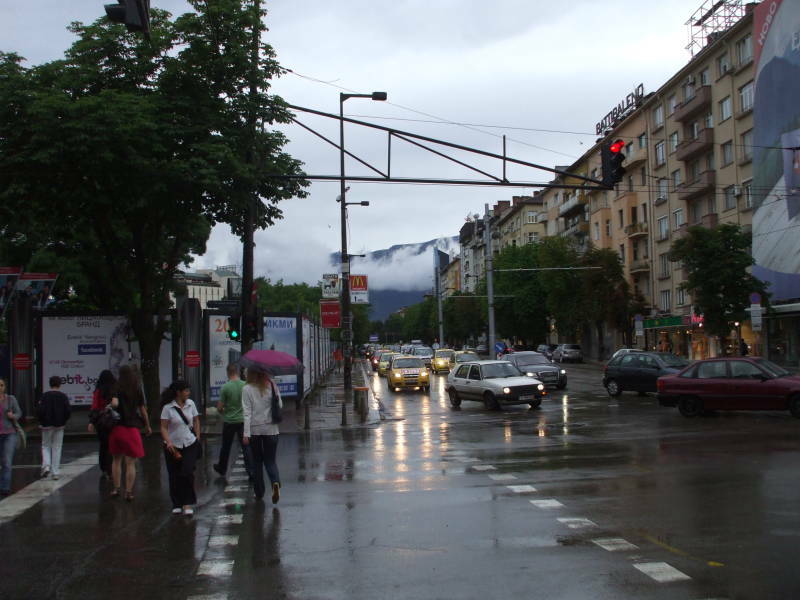 The boulevard is named for Mount Vitosha, a peak of 2,290 meters on the southern edge of the city and visible beyond the end of the boulevard. The people of the city can easily access the mountain by city bus for hiking, skiing and climbing. A project is underway to renovate the street in the style of the 1930s with Art Nouveau kiosks, benches and street lamps, fountains and open-air bars. Meanwhile НДК or NDK, Национален Дворӣц на Културата, Natsionalen Dvorets na Kulturata or the National Palace of Culture, provides 1981 architecture with a faint whiff of nepotism. The general idea came from Lyudmila Zhivkova, daughter of Bulgarian leader Todor Zhivkov. The design came from a team of Bulgarian and foreign architects. 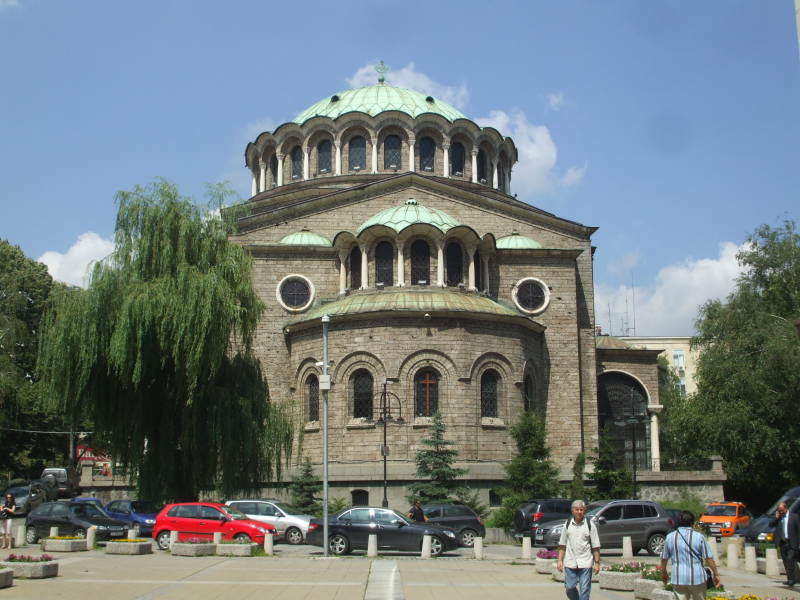 Sofia's location in a high valley gives it the coldest climate of Bulgarian cities. 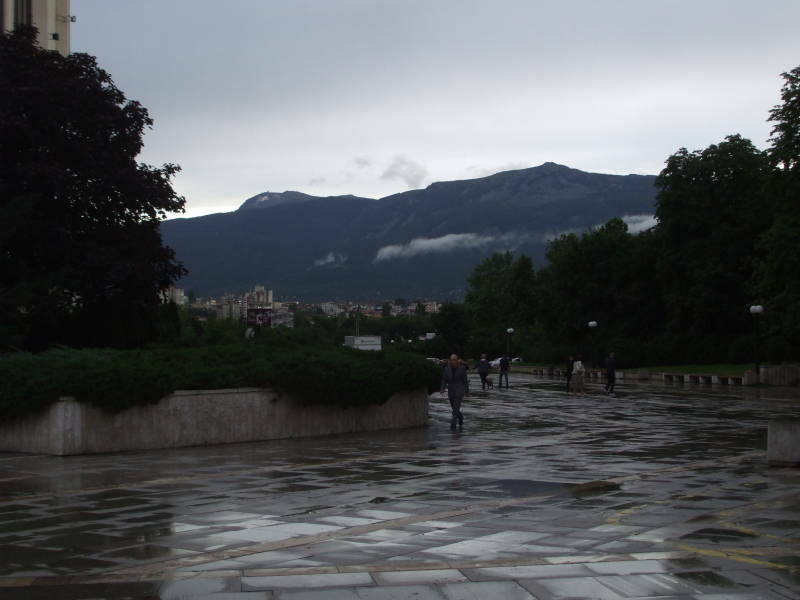 The low temperature and moist air can make for atmospheric scenes as low clouds wrap around Mount Vitosha. 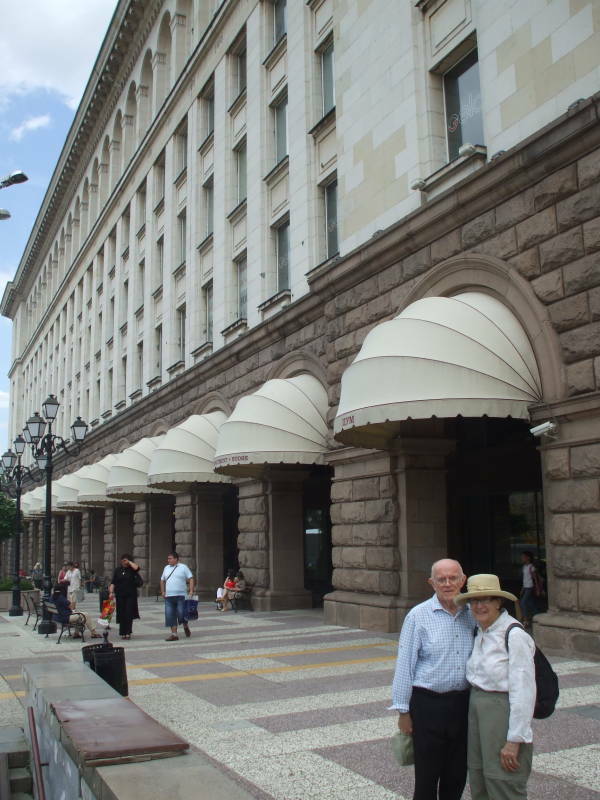 Here's another surprise: ЦУМ or TzUM, Централен Универсален Магазин or Tsentralen Universalen Magazin, the Central Department Store. It was built and opened in the mid 1950s, extending off the west end of the Largo complex. It underwent major renovations in 1986. There are arched walkways outside and a large open atrium inside. It was originally built as a store selling everyday goods to the common people. Changes in ownership starting soon after the fall of communism in 1989 changed it into an arcade of high-end boutiques. The number of customers fell from about 120,000 per day in 1988 to about 7,000 in the 1990s. By 2010 it was back up to about 12,000 per day, which is still one-tenth that of the later years of communism. 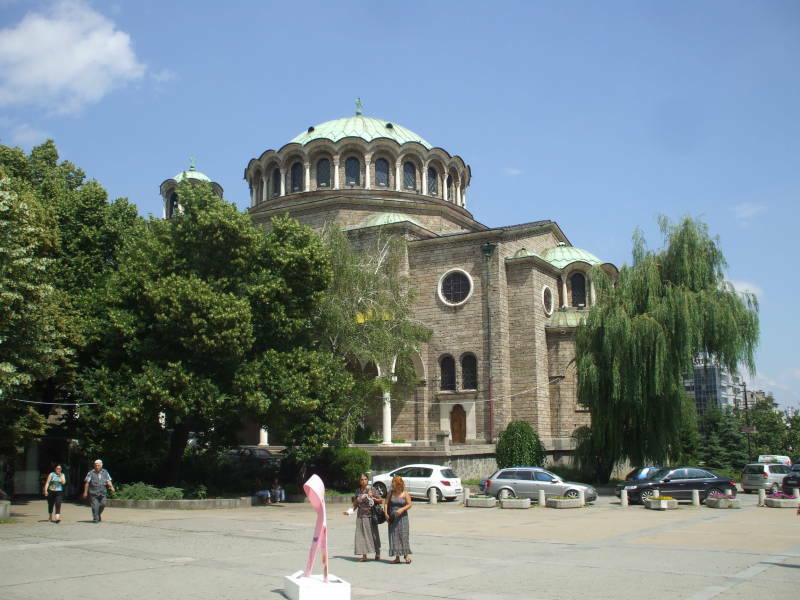 Aleksander Nevsky Cathedral is one of the symbols and primary attractions in Sofia. It is Храм-паметник "Свети Александър Невски", Khram-pametnik "Sveti Aleksandar Nevski", a cathedral named in memory of the Russian Prince of Novgorod from the mid 1200s. He's the one who led the Russians to victory over the German and Swedish forces, defeating the Teutonic Knights in the 1242 Battle of the Ice as depicted in Sergei Eisenstein's classic movie. 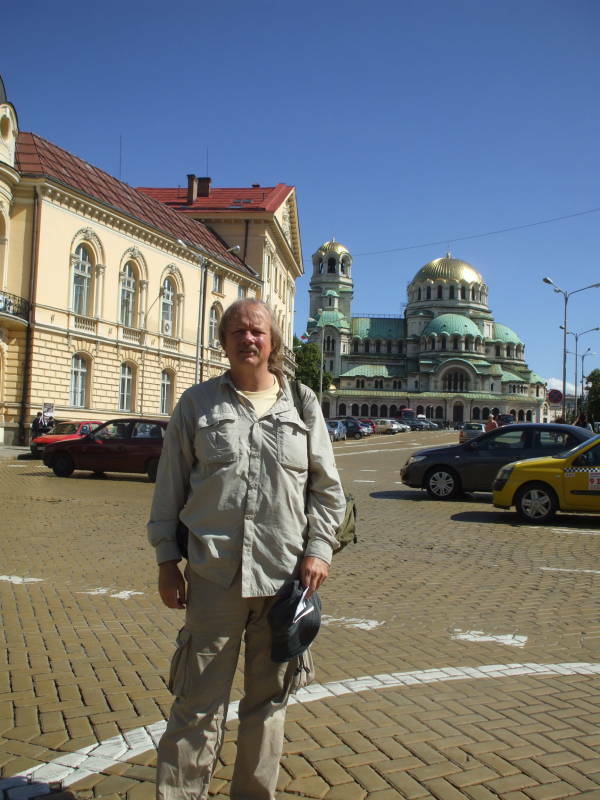 Here I am on ulitsa Tsar Osvobodite with the Aleksandr Nevsky Cathedral in the background, and in the other picture, my parents. 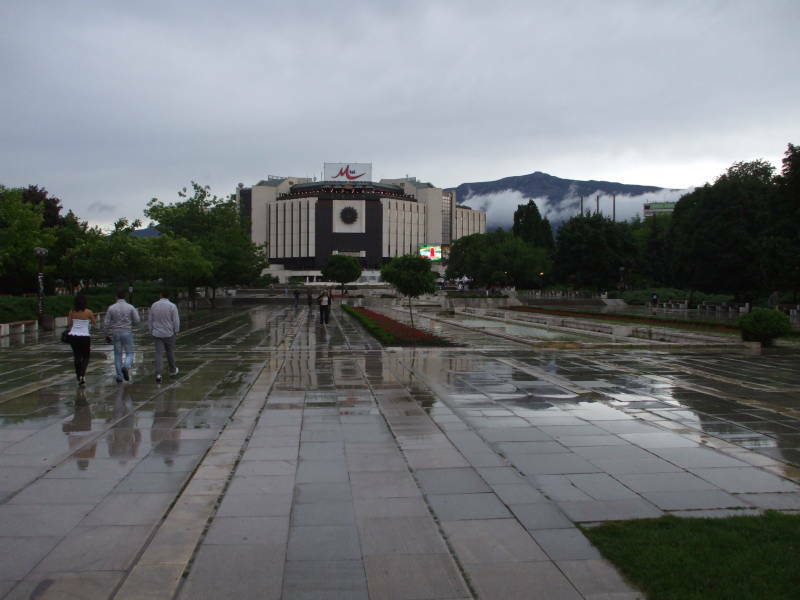 The National Assembly meets in this nearby building. 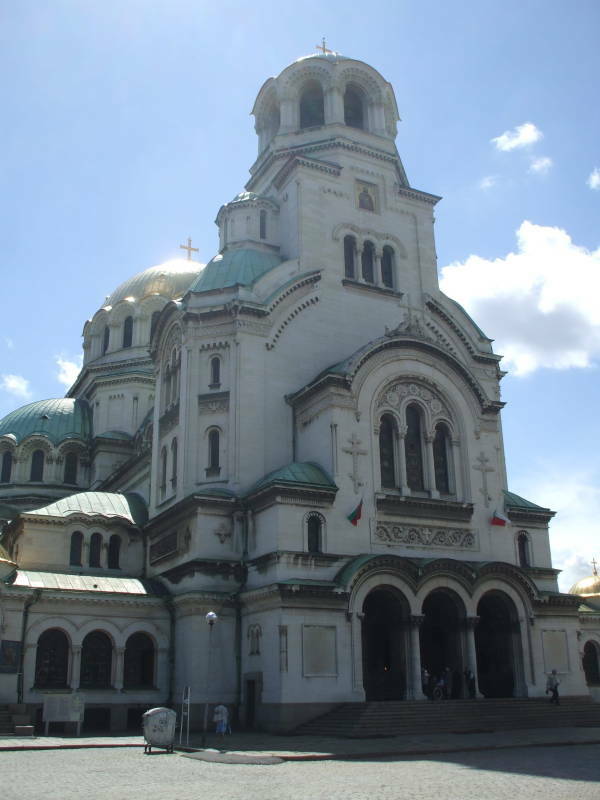 It was established in 1879, soon after the Russian forces liberated Sofia from Ottoman control. This building appears on the reverse of the 20-leva banknote. Anyway, to the cathedral. It was built in honor of the 200,000 Russian soldiers who were killed in the 1877-1878 Russo-Turkish War that liberated Bulgaria from Ottoman rule. 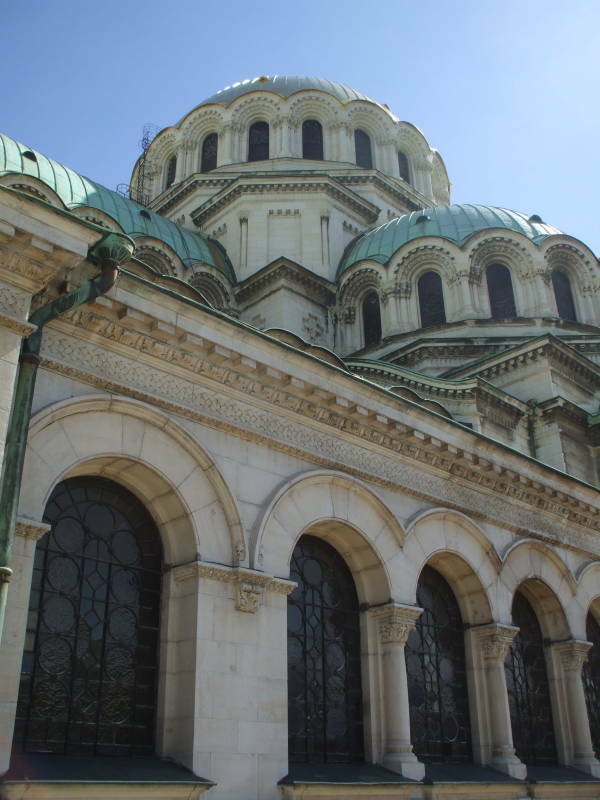 The cathedral was designed along classical Byzantine lines, but construction only started in 1882. The project was very slow getting started. Most of the construction happened between 1904 and 1912. From the right locations you see the alignments of the semi-domes within semi-domes of the apses leading to the main dome. It's the same fractal-like optical effect that you see as you approach the Blue Mosque in İstanbul. 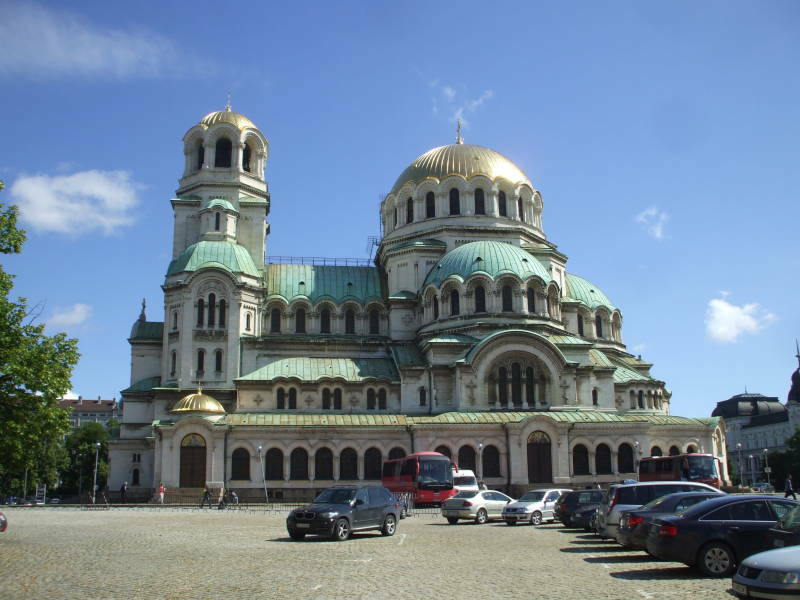 This is the cathedral church of the Patriarch of Bulgaria. It can hold 10,000 worshippers. There are mosaics, frescoes, and decoratively carved marble and other multi-colored stone both outside and inside. The main dome above the nave and the dome on the bell tower are gilded. 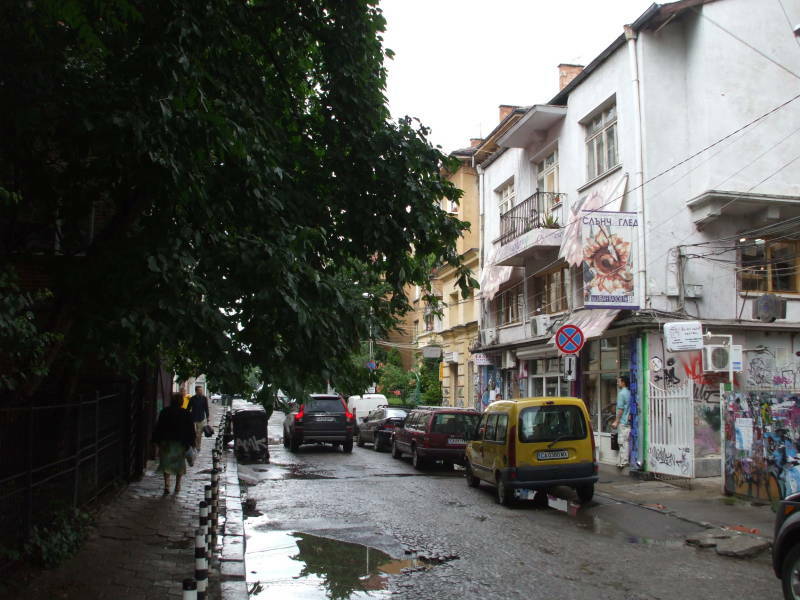 Here is a view down Улица Иван Вазов, Ulitsa Ivan Vazov, a fairly typical side street in central Sofia. 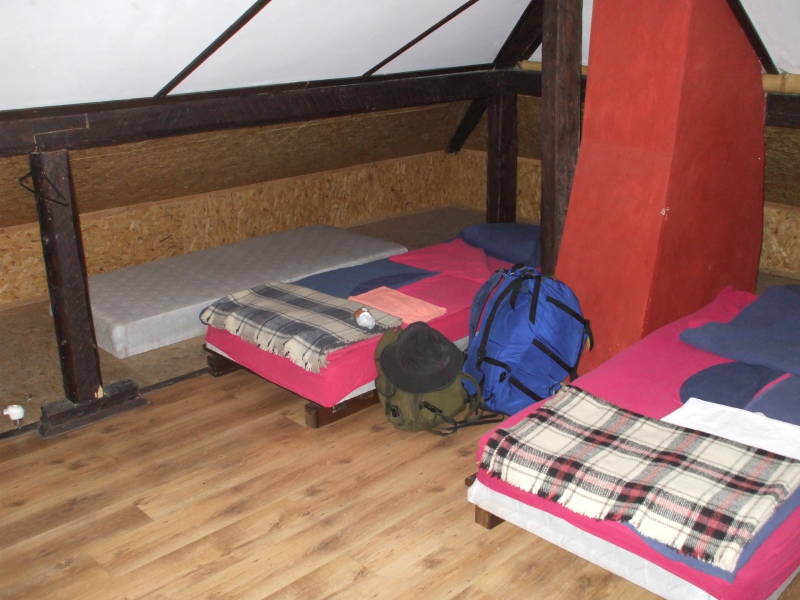 We stayed here, at the nicely located Be My Guest Hostel. You enter through that white gate beside the yellow car, cross a courtyard, and climb a staircase to the second floor. The entry to Be My Guest is straight ahead on the left. 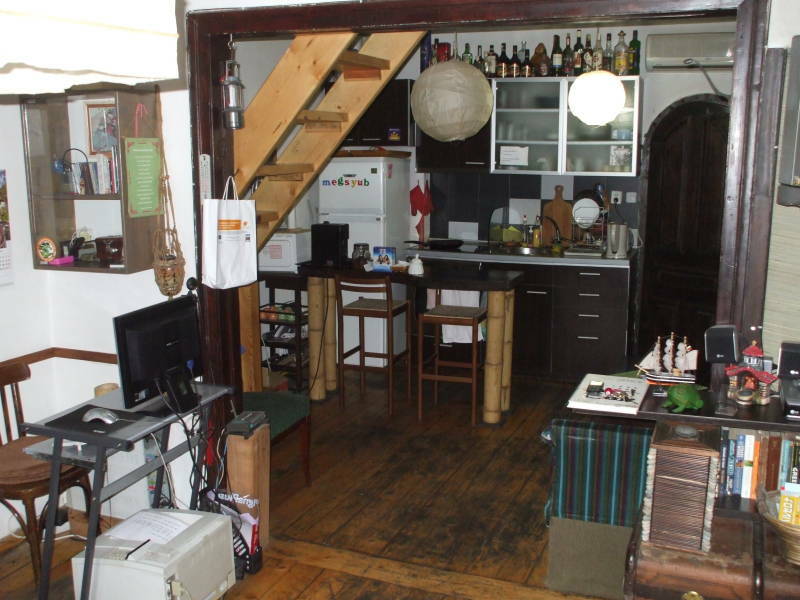 There is a common living room and kitchen. 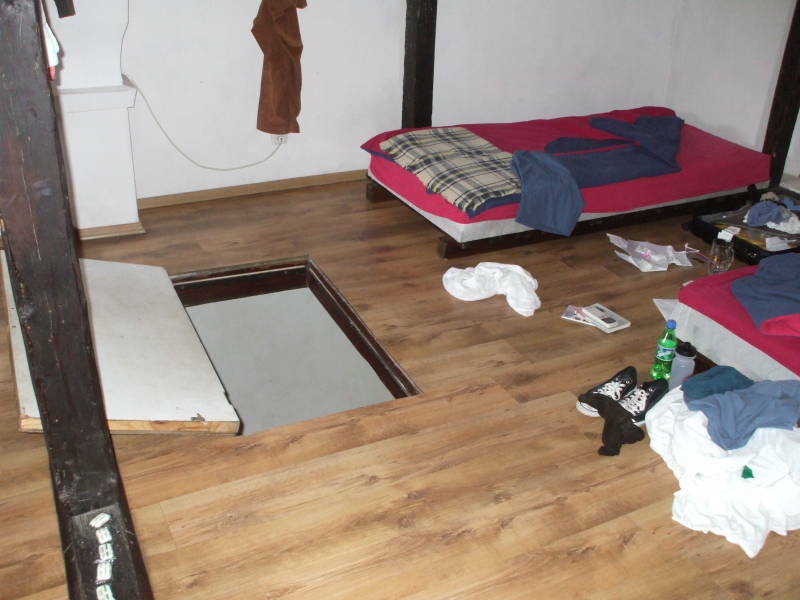 There are private en-suite rooms off the living room. 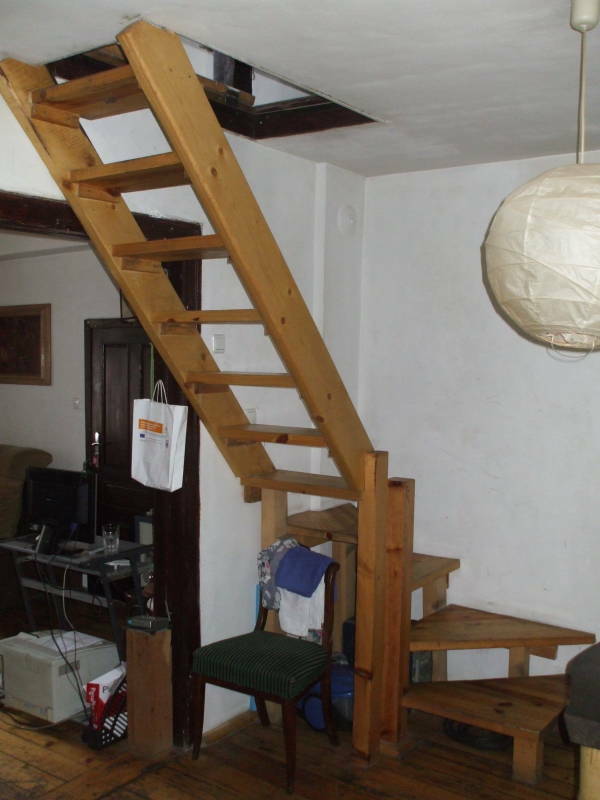 A steep staircase leads up from the kitchen through a hatchway into the upstairs shared dorm area. Here's the shared bathroom in in the upper loft area at Be My Guest. It's very nice! So many people worry about what the toilets will be like in a foreign country. Usually they worry far too much, sometimes to the point that they don't visit other countries out of fear of foreign toilets. Don't worry, Bulgarian toilets are fine. 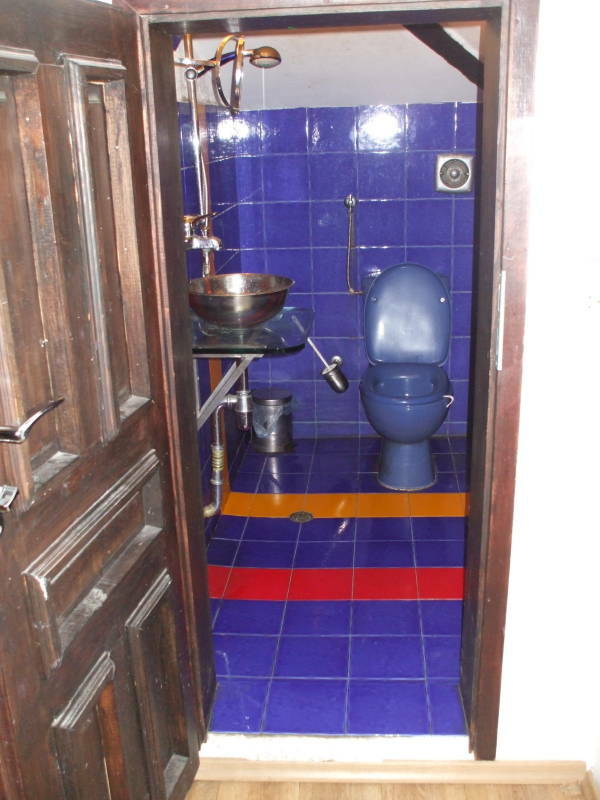 But if you want to investigate them in detail, see the relevant section of my Toilets of the World site.